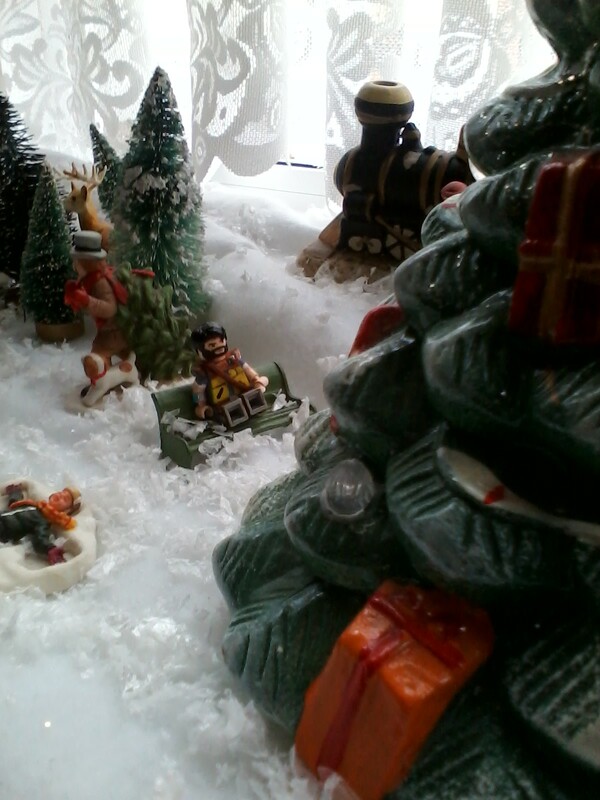 This year our little town has added some decorations, so I decided to share these with you. This is the town I grew up in, it’s a small town that sits right on Lake Michigan, and when you look across the drink you can see the Chicago skyline. Along the lake front is a beach and a park. I have so many great memories of bike riding with my dad through the park, 4th of July Fireworks, laying out at the beach with my BFF getting’ a tan and sledding in the winter with my brothers and sister. Over the past couple of years, they have really renovated the park, with sidewalks to walk along the lake, beautiful gardens, gazebos, benches and trees. Now it is extra special for us, because we were able to get a bench in memory of my dad, and my niece also had a tree planted for him. He always loved the lake and the park. My daughter and I went out the other night in the freezing cold to get some pictures of the holiday decorations. 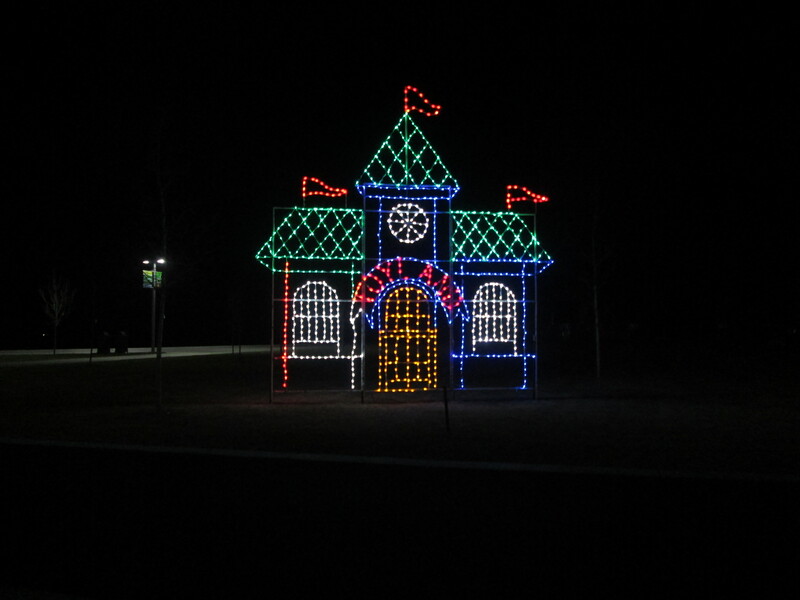 All through the park there are lighted displays on both sides. You can drive through or get out and walk. The lake is to the right, and the park to the left. The other night we went to a musical at one of the churches out here. It is a living Christmas tree. It is a huge tree that is covered in lights and is about 4 or 5 tiers high, and the singers actually stand on each tier, and as they sing various Christmas carols, the lights are synced with the music. 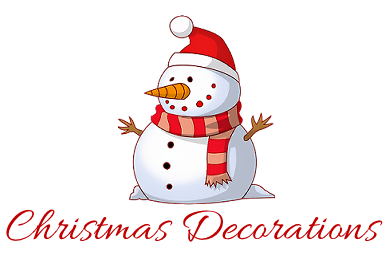 It was called Snow Biz, so there were snowmen and snow decorations all over the church. It was a really good show, the kids really enjoyed it. This is what is on the front lawn of the church. I just loved this guy!! So cute!! This is the snowman that greeted you when you walked in the church, so clever!! You captured it all in this small space. What a festive town! 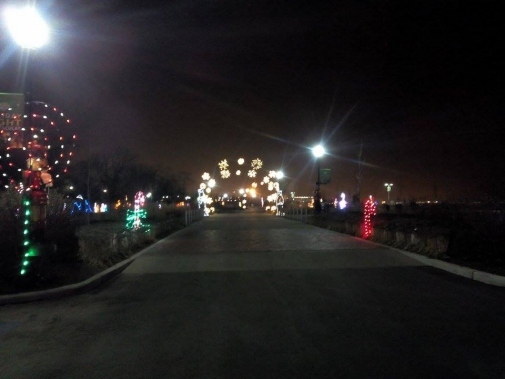 What a lovely thing, to be able to walk around and enjoy the lights like this! Love it! LOL about the Clone Troopers (sounds like something my son would enjoy too!)…. These decorations just made me smile. 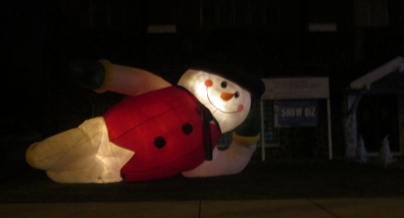 Especially the big light up snow man just chillin. So adorable!! 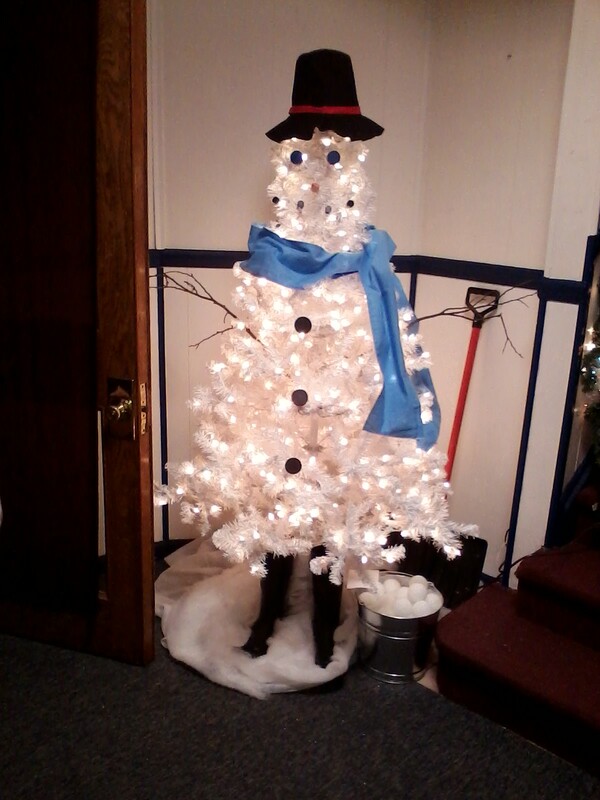 And I saw a snowman tree like at your church on Pinterest & thought it was an awesome idea! But the clone trooper in your village was icing on the cake. Love!! 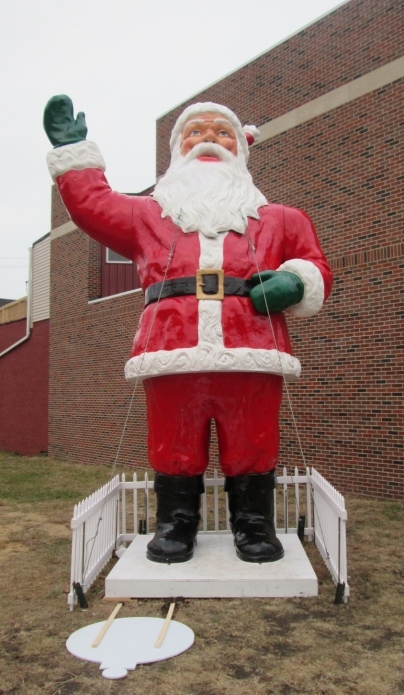 What neat decorations that your town puts on. I’m sure it’s a delight to drive around town and see it all! Love that sassy snowman!